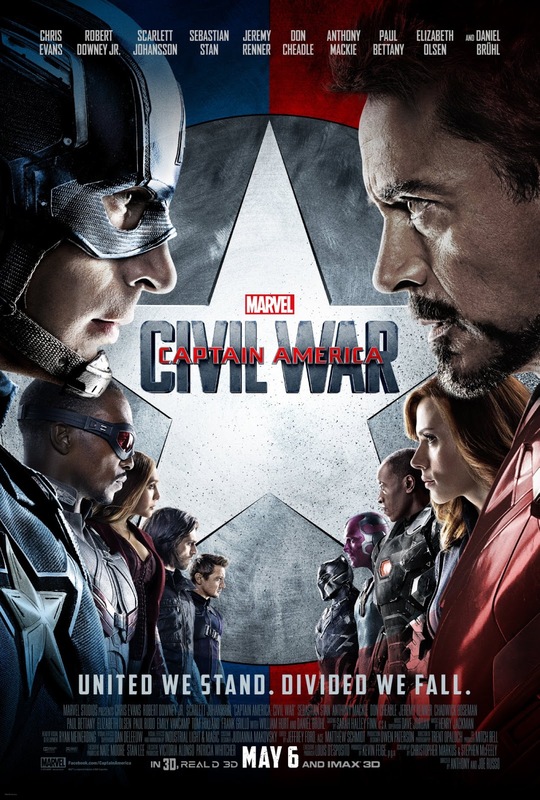 Starring: Chris Evans, Robert Downey Jr., Sebastian Stan, Daniel Brühl, and more. Marvel fans rejoice! The story-line comic book fans have been waiting a long time for has now come to life on the big screen, ‘Captain America: Civil War’. How will it be done? How will stories be altered? What will be the results of a film-adaptation of this story? Many questions and debates have rose but now are finally answered as May 6th, 2016 has come and our favorite band of super heroes are now not only back, but they are fighting a foe unlike ever before: Each other. Civil War starts off with a flashback scene dating back to 1991 where we see a mysterious figure retrieve a package from a car which has crashed by the hands of the individual. Soon after this mysterious flashback scene concludes we resume back to present day as Tony Stark (Robert Downey Jr.) is conducting a presentation for a college. On the flip-side of things, Captain America (Chris Evans) takes members of the Avengers on a covert mission to retrieve a highly dangerous biological weapon from a band of mercenaries. Although a seemingly simple mission for the super-powered team, it takes a turn for the worst as a near-death incident causes Scarlet Witch to act quickly in order to save her team mate. Yet in the process she causes a major explosion in a nearby building, causing many civilian casualties which the Avengers team is far too used to with their recent activity around the world. This incident sets in motion the Sokovia Accords, a document which puts the Avengers team under strict government control where they only operate where the government tells them to. These Accords are no simple matter to sign however, where the team is split in agreement and disagreement with the terms of the Accords. Thus creating a lit fuse which will only result in chaos for the Avengers team. However, everything is not as it seems while these events occur. A certain individual is operating in shadows to get what they want as the team begins to split. Marvel/Disney is a monstrous force in the film business with their superhero movies. They have set the bar so incredibly high that you almost can not compare these movies to other films because they simply trump the competition unless it is of their own brand. With that being said, ‘Captain America: Civil War’ met my predictions perfectly. I absolutely loved this film. Never before have we seen a superhero movie where so many of our beloved character are not only in the movie, they are fighting each other in all their super-powered glory and for longer than 5 minutes (Yes, I am looking at you BvS). The introduction of new faces were fantastic and even beyond the much anticipated arrival of Spider-man. Black Panther, Spider-man, Ant-Man, Scarlet Witch; all of their screen time felt natural and needed for the movie, as well as the returning faces we all know and love. The villain behind the scenes was great. All of his/her actions were methodical and evil and it was almost as if he was the puppeteer beyond the true Civil War going on. Beyond the plethora of pros this film had for me, I do have simply one comment for the cons. The humor did seem too much at times. Although hilarious at every moment, there were times where they could have done without it and simply let the action carry the movie on its own. Regardless, as I spoke of before… While most can critique this movie, when you put it up against other Marvel movies, it can be easy to say what was better or what was worse but when it comes down to Marvel vs. other typical movies: Marvel wins each time. ‘Captain America: Civil War’ will not disappoint. It is a movie for all viewers and of all ages. This is a must-see movie for 2016. Special thanks to some of my colleagues and friends for input: Steve, Jalen, Shawn, Mike, and Dylan. Posted in 2016 Movies, Marvel, Movie Review.